Authorities acknowledge they need months before power returns to some regions. 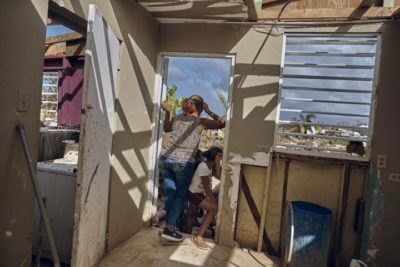 Still, energy experts say the rebuilding effort offers a unique opportunity to outfit the island with the electric grid of the future: a state-of-the-art system built from scratch using renewable energy sources like wind and solar, which would be cheaper to operate and would respond better to the next hurricane. The reimagined grid would rely on the concept of a microgrid, which are localized electric grids that allow communities to keep power even if centralized power plants are not functioning. Click here to read more. The company has already begun shipping energy storage systems to Puerto Rico, and hopes to have the first microgrids up and running in a month’s time. 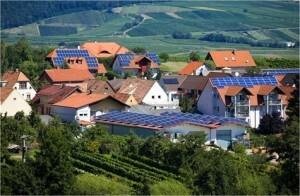 Photo: A sonnen community in Germany with solar + storage.. This entry was posted in Energy Storage, Green Building, NewsBlog and tagged microgrids, Nebraskans for Solar, PR Newswire, Puerto Rico, PV Magazine, renewable energy, Sonnen, Time Magazine on October 3, 2017 by Helen Deffenbacher. Over the past decade, Congress has not passed a single bill that takes direct aim at climate change. Yet at the same time, the U.S. has led the world in reducing carbon-dioxide emissions. That progress has been driven by cities, businesses and citizens, and each group is determined to keep pushing ahead. In fact, if the new Administration withdraws from the Paris Agreement, as the chair of the Global Covenant of Mayors, I will recommend that the 128 U.S. mayors who are part of the group seek to join in its place. Cities would benefit from stronger leadership and support from Washington, but they aren’t waiting on it. To find out where the country is heading, don’t follow the national headlines. Get involved locally. That’s where the action is. 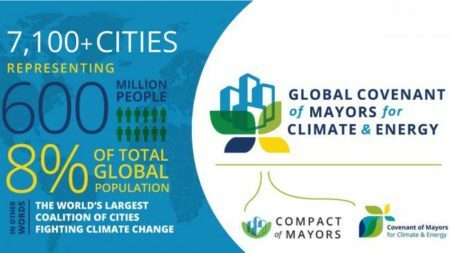 This entry was posted in Nebraska / Midwest News, NewsBlog and tagged Global Covenant of Mayors for Climate & Energy, local action on climate change & renewable energy development, Midwest Cities Committed to the Compact of Mayors, Nebraskans for Solar, the economic benefits of climate action, Time Magazine on December 31, 2016 by Helen Deffenbacher. On a crowded stretch of one of the Twin Cities’ busiest freeways, a glassy new five-story building announces itself with a large sign saying, “OATI Microgrid.” Inside the building in Bloomington, workers are putting the final touches on the OATI Microgrid Technology Center, which features solar panels, wind turbines, a combined heat and power plant and energy storage. It’s part of a pilot project for Open Access Technology International, a Minneapolis-based company that provides cloud-based software applications for more than 1,600 clients, including independent service operators (ISOs), electric cooperatives, energy traders and utilities. Continue reading. Photo by Open Access Technology International. A rendering of OATI’s new office building in Bloomington, Minnesota, equipped with a microgrid powered by renewables and CHP turbines. Rocky Mountain Institute’s Business Renewables Center (BRC) Nearly two-thirds of Fortune 100 and nearly half of Fortune 500 companies have set ambitious renewable energy or related sustainability targets. The BRC helps corporations to fulfill their sustainability goals. RE100 is a collaborative, global initiative of companies committed to 100% renewable electricity. Click the RE100 link to read about the actions they are taking and why. Corporate Renewable Energy Buyers’ Principles. The Principles publicly launched in July of 2014 with 12 signatories, initially representing 8.4 million megawatt hours of renewable energy demand by 2020. As of September 2016, 62 companies have signed on, representing over 45 million MWh of annual demand by 2020. This entry was posted in Nebraska / Midwest News, NewsBlog and tagged Birmingham Business Journal, Corporate Renewable Energy Buyers' Principles, EcoWatch, Electrek, energy storage, Nebraskans for Solar, Open Access Technology International (OATI), RE100, renewable energy microgrids, Rocky Mountain Institute Blog - Outlet, Rocky Mountain Institute's Business Renewables Center (BRC), Time Magazine, Treehugger on December 7, 2016 by Helen Deffenbacher.